✅ Trip Verified | A truly awful airport, old metal seats in departure lounge number 2, disgusting toilets that stink. The whole building is old small and not fit for purpose. The ground staff are over zealous on hand baggage size, one guy actually carried a tape measure and small scales to catch passengers out. My bag was the same size and weight as the outward trip, the airline staff at Kiev Borispol had even seen and said yes it's fine as hand baggage. Not at Odessa departure terminal. So £48 charge later and would I fly there again - no way. Yet the arrival x terminal is very modern in fact it's still being finished off. Just knock the old terminal down think 1950's design because that is it. ✅ Trip Verified | Arrivals to “new” terminal, departures from old one. Heavy congestion could be at customs, especially if there are >2 flights there at the same time. WiFi is unreliable. "number of seats are not sufficient"
✅ Trip Verified | This airport is called an international airport, but in general it only matches a 1970 Soviet local bus terminal standard. The building is old-style and dirty, the seats are arranged in a very awkward way and the number of seats are not sufficient. No air-conditioning before the security check, WIFI signals are very weak and unstable, meanwhile in a very slow speed. Electronic boarding pass is not allowed so everyone has to go to the counter to check-in. The staff there are rude and do not really want help you, they can speak very limited English. There is almost nothing after the security check, a very shabby bar only. Odessa International Airport is the worst airport I've ever experienced. I will not come to this place for sure. ✅ Trip Verified | Infrastructure lacking, excellent welcoming courtesy. Plane from VIE landed on the one runway, turned around, and taxied to a parking area, from which we descended staircases promptly rolled up to the front and rear doors. This airport does not know the concept of "gate." We walked to a huge barn of a building and all joined the line of non-Ukrainians. At this point, some passport control official undertook a mental exercise called "thinking" -- let's open the other line (for Ukrainians) for these passengers. That immediately cut the wait in half (my wait was 4 minutes). The passport official who stamped my passport smiled (note to US CBP agents: that's when the ends of the mouth go up) and said "Welcome." Then enter the other half of the huge building, with a currency exchange, a clean bathroom, and not much else. Overeager taxicab drivers were in abundance, but I (and many of us) took the Viking bus to our river cruise ship. "new terminal but old rules remain"
❎ Not Verified | They opened a new terminal but old airport rules remain. Like airport entrance door closed! Even in Ukraine, haven't seen such idiocity in any other airport. As we landed on December 20 and got out of the aiport bus, we stopped near closed entrance door and stayed there in cold for at least 10 minutes. People were amazed and couldn't understand what is going on, since there was nothing to do some started smoking. An airport employee started yelling that it is not allowed. We asked if at least standing is allowed. She said yes, standing is allowed but not smoking. She also announced that she informed about our bus arrival and she's standing there much longer than us without smoking. And accused passengers in having no patience. Annoyance from the very first steps on Ukrainian land. Welcome to Odessa. When we finally got in, we waited forever in border control lines and then for our luggage delivery. Border guards were all over armed and watching us like we were not travellers but some criminals. With a few airplains a day in that airport they manage to do everything way too long! New terminal was cold just like the old one. Toilet cabins had no hooks to hang a purse and toilet paper was on toilet cleaning device instead of normal place. "most horrible service I have experienced"
❎ Unverified | The most horrible service I have experienced. Staff are rude, ambience is stressful and not organized. Even domestic flights seem like a nightmare as staff do not know how to be professional and organized. Big attention to people who will travel from October 2017, if you don't have a printed ticket the airport has a right to charge you 20$ (which is ridiculous). How is it possible nowadays to charge for what you have already in the system. I travel for business every week, so clock up a few miles and experiences along the way. 3rd time through Odessa and I can say it doesn't get any better. The airport is tiny and you would at least hope their process and procedures would be top draw. Well, you would be wrong. Poor process compiled with staff who don't give a damn about the pain passengers are suffering just makes it the worst airport I have been to. The staff don't realise they are in a service industry, so do not smile and are surly and rude. How can Kiev get it so right while this big holiday city airport can't. 3 times I have had to experience this coupled with the poor Turkish Airlines service, that means I missed my connection today and write this from my hotel room in Istanbul. Honestly, I would trust these people to run me a bath, let alone an airport. Arrival at 21.00, crowded and awful organised arrival area. People were being off loaded off by busses in inner yard and had to fight their way through "luggage" area through a small exit door. Crowded, unorganized hall, overpriced cafes, be aware of pickpockets! From 20.00 no public transport to center. Neither Marschrutki nor Trolleybuses! Information office offers taxi ride to center for crazy prices (20-30 USD). Better simply to cross the parking lot and to ask the waiting taxidrivers there - they will drive you for 150 UAH or less (7 USD). 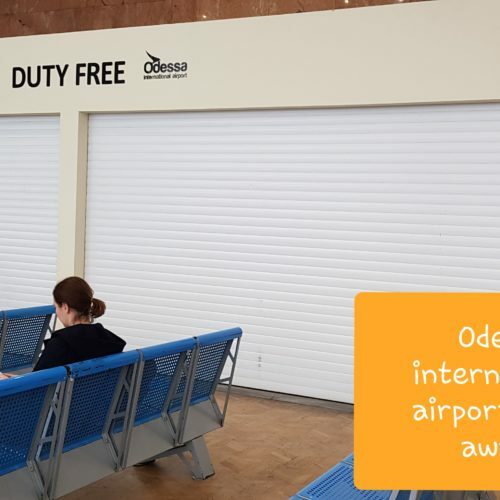 Have experience with several airports in Ukraine - ODS is THE worst! Arrived but didn't depart from the airport (VIE-ODS). Since I was carrying a significant amount of currency ($2500) I was politely questioned by customs but otherwise treated very well. After I told him where I was going he warned me that it would be expensive to take a taxi. The trick is that you need to call in advance. The taxicab mafia wants $50 and they stick together. If you call directly you can get a ride for $10 or so and they'll arrange for a pickup. Always arrange for pricing in advance. There's also a very inexpensive autobus that takes you into the city but can be crowded. I was in and out of the airport in 20 minutes. Don't exchange a lot of money there. Just enough to get into town. You'll find a better deal at places just a few blocks from the centre of town. The terminal was like a long low shed tarmac potholed very poor quality. The terminal was old and tired but reasonably clean. The toilets were disgusting on the departure side. Arrival and departure procedures involved queuing several times unfriendly unsmiling personnel. We were herded onto buses from our incoming flight to travel approximately 150 feet to queue for customs. There were two unsmiling agents processing incoming passengers. Apart from the larcenous taxis - despite negotiation we still ended up paying about 2.5 times what the fare should have been into the city. To put it mildly this airport is not an asset to Odessa and is the worst airport I have ever been in.